Dear users we are very happy to announce that from now on we would be moving to a better organised portal. This is a Forum for all your Bank exam needs - Clerical , Probationary Officer PO , Specialist Officer SO , Assistant Manager AM , Management Trainee MT. Herald, Nav Bharat Times and Tribune. and Tribune. 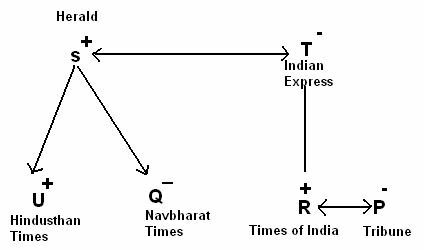 Q reads Nav Bharat Times and is the sister of U, who reads Hindustan Times. R does not read Tribune. 55. How many sons T have ? 56. Who among the following reads ‘The Times of India’ ? 57. Which of the following News Papers is read by P ? 58. How is U related to T ? » Practice Dreams to interperate? Save your Important Pages / Post / Bookmark using this Widget !